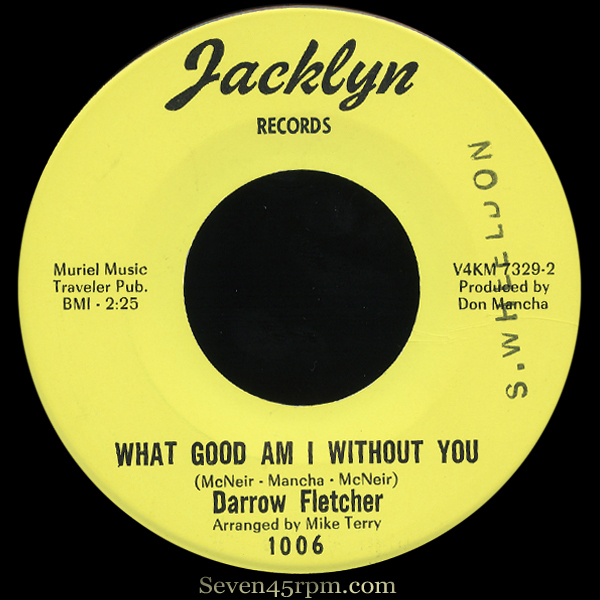 Jacklyn Records 1006 US Year 1967 https://seven45rpm.files.wordpress.com/2013/12/s45-darrowfletcher_whatgoodami.mp3The first time I heard Darrow Fletcher, which was a few years ago now, was one of those life changing experiences. An instant connection and a desire for his records and his sound. A man with an active 7″ soul catalogue, however somehow still quite unknown and mysterious as far as main stream popularity goes. Wasn’t really too sure what to present for my first DF post, but why not go with one of his very best on Jackyln. But first a little history on this great man, and the best place for that lesson is to dig over at Soul Source. Darrow, born 23 January 1951, moved with his family to Chicago when he was 3, from the Detroit suburb of Inkster. It seems even as a young 6 year old, he was never uncertain about his stage and singing destiny. His love and enthusiasm for song and performance was a gift he must have truly accepted without any hesitance. Whilst he was a freshman in high school in December, 1965, he recorded “The Pain Gets A Little Deeper”, written by himself and producer Ted Daniels, and cut with the help of his stepfather-motivated business man, Johnny Haygood. Is this really the voice and heart of a young 14 year old school kid !? An impressive debut to say the very least! The record was leased to Groovy, a small New York label owned by Sam and George Goldner and Kal Rudman. They got the record on the national R&B charts for seven weeks in early 1966, and was also released on London in the UK. Soon Darrow was touring the “chitlin” circuit, playing venues like The Apollo, The Uptown and the Regal, where, in July ’66 he shared the bill with B B King, Lee Dorsey and Stevie Wonder. 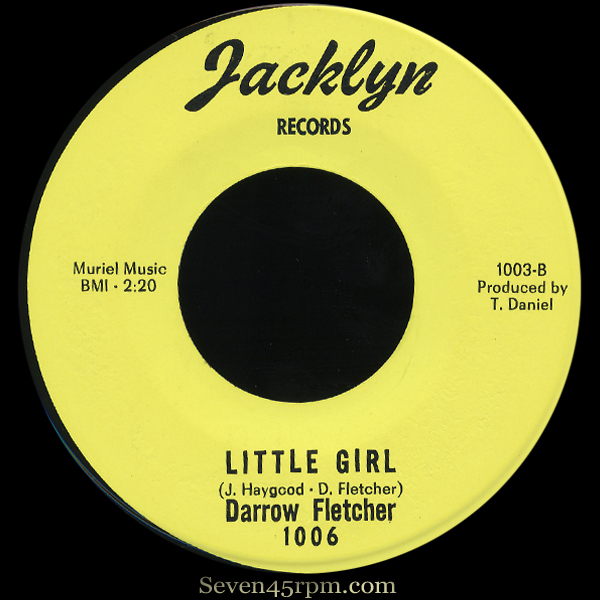 Following three not so successful follow-ups on Groovy, Darrow’s stepfather formed Jacklyn Records in 1966, named after one of his daughters. Darrow cut three singles on Jacklyn, “Sitting There That Night” scored immediately, 2,500 sales for the record in Chicago alone. Darrow co wrote it with his stepfather, and is also providing one of the sweetest guitar solos here, still at the age of 14! The flip “What Have I Got Now” is an insanely beautifully tempo-ed soul track and makes that a 7″ monster must have! What Good Am I Without You was penned by Don Mancha and produced and arranged by horn player Mike Terry a year later. Again, this is a very big song and arrangement. The pace is high, just as the heart is beating. The strings and backing vocals are stuffed with passion and the chorus is an out pour! To tell you the truth, I’m really not sure if it can ever get better than this! The flip’s Little Girl is a sweet ballad Darrow co-wrote again with his stepfather. I think it’s fair to say that Darrow had two very distinctive periods to his career. The first part were the records he made in Chicago between 1965 and 1970, and then the handful of singles cut in Los Angeles in the 70s, which had quite a different more modern soul feel, which I’ll dig deeper into in related future posts. But I love them all. There’s an honesty in his voice that I find so compelling and desirable and I hold him up high in praise as one of my all time favourite artists.